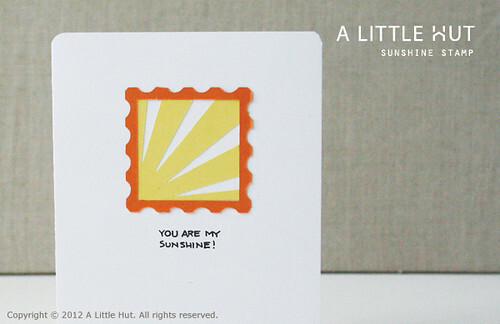 You Are My Sunshine is what I used to sing to the kids when they were babies. If I think about it too much it gets me all teary. I of course still love them to pieces but the memories I have of them as babies are just the sweetest. So this is the freebie for this week. Remember that if you're interested in sharing your project you can add your link at the end of this post. Click on the blue bar. You'd think I don't suffer from this problem but I do. I never have a card ready when I need one. I decided to tackle some of my scraps and correct the situation with some simple ideas. 1 — A trimmed section of Rings Lattice on an angle with a strip for a sentiment held by a bubble cap. 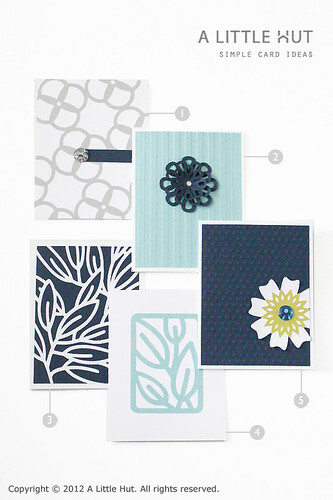 2 — Embossed background and a Mod Blooms flower with a rhinestone center. 3 — A random section of Just Leaves (A Little Hut exclusive file) on navy colored paper. I cut out a 12" piece of paper so there's still plenty of leaves for other small projects. 4 — A simple tag in the center of a card. 5 — Embossing folder with a white Lots of Petals flower and a Mod Bloom cut out in the center. The embellishment is an Ephinay Craft bubble cap. I'm sorry but I don't have any Friday Tidbits today. I've tried to stay off the internet as much as possible. Having the kids home full-time changes things around here but it's definitely a nice change of pace. EDIT! - I do have one: Stencil baby body suits as a baby shower game! A tutorial by yours truly.